The Marquette Academy Go Club is responsible for all funding for our High School Athletics and all things associated with sports. (uniforms, hiring referrees, transportation, maintaining facilities) Your support is appreciated and necessary for the success of our programs. Each student that participates in a sport is directly affected by the efforts put forth by you and the Go Club. Thank you for supporting our athletes! Over the past 6 years, the Coach Bob Strickland Scholarship Fund has asisted over 25 students with tuition grants. These are students that attended Marquette Academy High School and have graduated, or are currently in school due to the assistance we were able to provide. In order to continue our Scholarship funding we need to raise the funds to supplement our efforts. To repsond to this we are introducing the Bob Strickland 12th Man Club for the upcoming Football season. For a fee of $100 per person you will become a member of a unique club that will meet prior to each home Football game in the Grotto. You will be able to witness the long standing tradition of the Marquette Varsity Team in their pregame prayer ritual. At that time you will be given a coupon for a bottle of water and a bag of popcorn at the concession stand. 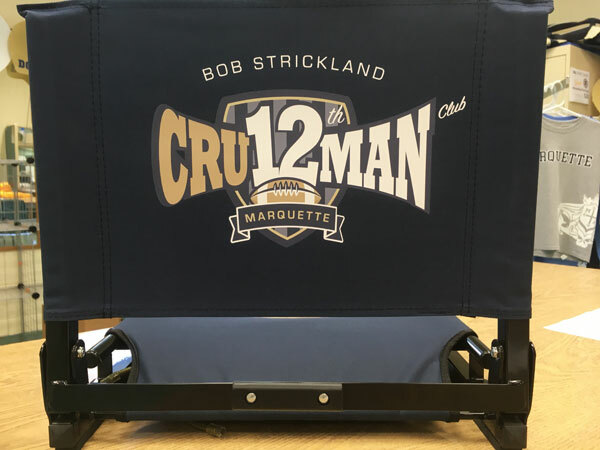 In addition you will receive a Stadium Chair with a logo identifying you as a member of the Strickland 12th Man Club. We hope that you will become a participating member of the 12th Man Club and allow us to continue to help our potential students fulfill their dream of atending Marquette Academy High School. Thank you for your continued support of Marquette Academy and the Strickland Scholarship Fund. Jerry Centoni and Star Ford Lincoln, Inc.